Since he previously reviewed “We Steal Secrets,” a documentary about Wikileaks and Julian Assange, I invited Reel Change guest critic Anthony Flores back to tackle “The Fifth Estate,” which opened last Friday. Here is his review. From the name alone, The Fifth Estate makes a big claim about its subject, the Wikileaks website. The name alludes to the common appellation of the press: the Fourth Estate. The name “Fourth Estate” itself is an allusion to the medieval Estates General, the three pillars of power in European societies at that time. With the rise of democracy came the rise of the free press, the Fourth Estate. Now, with the rise of the internet, comes the rise of the Fifth Estate. All of this is a roundabout way of saying that Wikileaks established a whole new institution. This is a huge assertion, as it implies that the internet and the digital revolution has changed every level of society. The safer assertion would be that Wikileaks has simply added another tool, another mode of operation, in the practice of journalism. 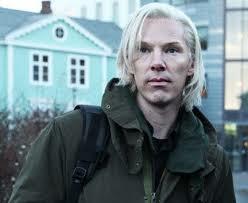 The Fifth Estate tries to make the larger claim, but it lacks the craft to drive home its point. Such lofty and grandiose assertions requires a special film to convince its audience, but, simply as a movie, The Fifth Estate is mediocre. Director Bill Condon (the last two entries of whose filmography are Twilight movies) handles the basics of plot and character with a clumsy bluntness. Character development is replaced by monologue about one’s past. Plot development is unearned. There is no articulated reason, early on, for the two main characters, Julian Assange and his original collaborator Daniel Domscheit-Berg, to even start Wikileaks, much less to upend their lives. In the latter half, as Assange begins to make increasingly erratic decisions, the ground work has not been laid. His motivations are non-existent. The film’s biggest failure, however, is what it doesn’t include. There is no mention in the narrative of the Swedish investigation into Julian Assange’s alleged sexual misconduct. Of course, in a fictional account of real events, certain omissions are to be expected if they don’t serve the narrative. But these allegations are too important to leave out. For one, they came out at the same time as the release of the diplomatic cables and war logs. The integrity of Wikileaks was called into question at the very moment it could least afford. More importantly, Assange acted with massive hypocrisy. The entire mission of Wikileaks is to encourage openness and accountability. Assange instead stonewalled and escaped. By itself, this would be a curious omission. When coupled with the film’s fervently pro-Assange message, it starts to feel more like a whitewash. This is inexcusable. The story of Wikileaks deserves an honest appraisal. This movie isn’t it.